Thank you! I really do recommend this book. She has such great practical advice. Hopefully you’ll find it helpful! I wrote about making friends as adults on my blog not too long ago. It’s definitely challenging, nice post. It really is, but so worth it when it works out! Technology really is such a lovely thing when it comes to staying in touch! Thanks! We all need that reminder now and again! A post that touches right to the heart. I, for one, have never been good at making friends; and since high school, they’ve slowly dwindled away. But you bring up a good point — and perhaps I’ve not been putting enough effort into it. It must be what I’m missing in marketing, too! Thanks for the eye-opener. Making and keeping friends is hard work, but worth it, in my opinion (and I say that as someone who enjoys lots of time on my own)! This book is definitely chockfull of good tips if you’re interested in some new approaches to a challenging task! 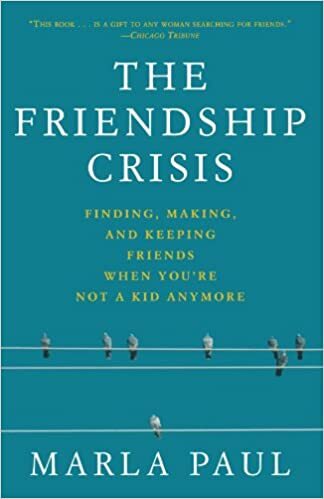 Pingback: The Friendship Crisis: Finding, Making, and Keeping Friends When You’re Not a Kid Anymore, Marla Paul | Was Ist Der Mensch? Thanks for this lovely post — I think I need to read this book. I’m in my last year of college, and my introverted brain is getting angsty about moving to a new city and finding new people. I’ve moved a lot and I know just how you feel! There is hope (and new friends) out there though, I promise!